Two members of the popular K-POP band Ladies’ Code tragically lost their lives in a car crash on September 3rd. The imagery of their last video depicted them literally flirting with death. 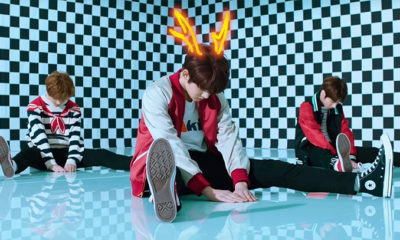 Were they the first Illuminati sacrifices in K-POP? 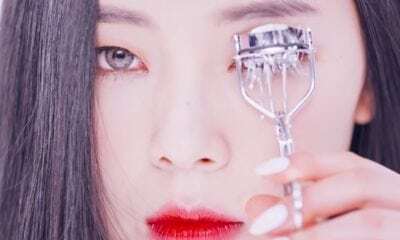 In 2013, I posted an article entitled A-JAX and Ladies’ Code: Two Blatant Examples of Mind Control Culture in K-Pop in which I analyzed Ladies’ Code’s Hate You – a music video that was all about Illuminati mind control and sadistic handlers. 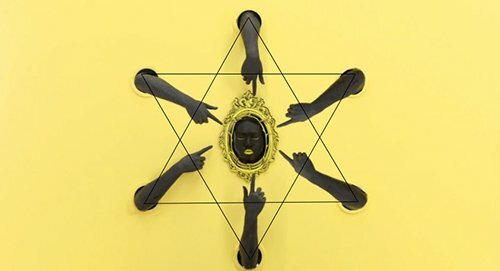 The disturbing imagery of the video was yet another proof that the South Korean music industry was subjected to the same sick Illuminati agenda as in the Western world. The video portrayed the singers as puppets with strings controlled by unseen handlers. Dolls representing multiple personalities; Markings on the wall indicating forced confinement; A butterfly flashing for a split second: All of these symbols alluded to Monarch Programming. One year later, two members of the group lost their lives in a violent car crash. 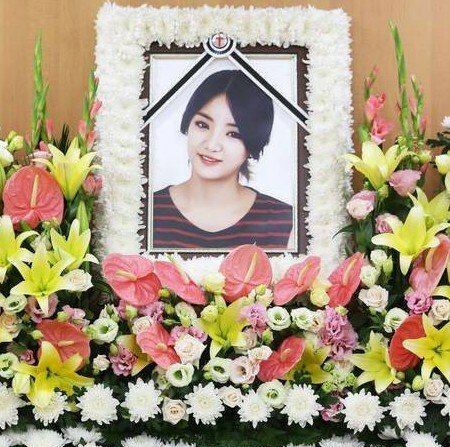 Singer EunB lost her life at the crash site while RiSe passed away a few days later, after hours of intensive surgery. 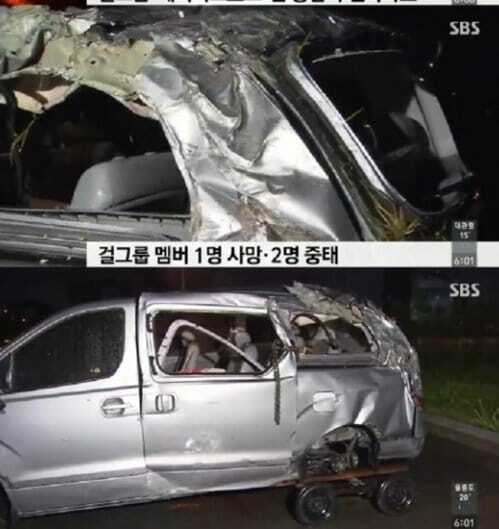 Shortly after the car crash, a few strange facts surfaced, causing some observers to believe that the van used by Ladies’ Code was sabotaged. First, the van was not the group’s usual vehicle but a rental that was “used for the first time”. Second, the airbags did not deploy. Finally, a wheel completely flew off from the vehicle. This is a rare occurrence, especially with recent vehicles. Pictures of the van used by Ladies’ Code. One of the wheels completely flew off the vehicle. 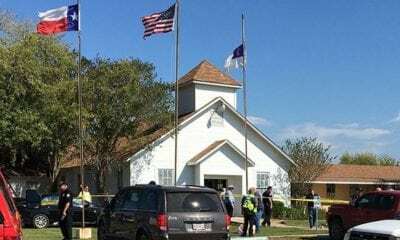 While this entire event can be written off as an unfortunate accident, there are signs of it being a pre-planned Illuminati sacrifice. The most troubling of these signs is the group’s latest video Kiss Kiss which clearly gives the group a kiss … of death. Does Kiss Kiss Foreshadow the Tragedy? Although the lyrics of the song Kiss Kiss are kissing a boy, the video gives the song a darker meaning: It is about, literally, the kiss of death. Released less than a month before the tragedy that killed singers EunB and RiSe, the video portrays members of the group exposed to death in several ways. Here are key scenes from the video. The video begins with the members of Ladies’ Code visiting a dead man lying inside a casket. The girls oddly act as if they are attracted to him. Later in the video, each member visits the dead guy and attempt to kiss him (why?). When EunB (one of the two singers who died in the car crash) visits the man, he gets up and kisses her. EunB literally receives the kiss of death. She lost her life one month after the release of this video. 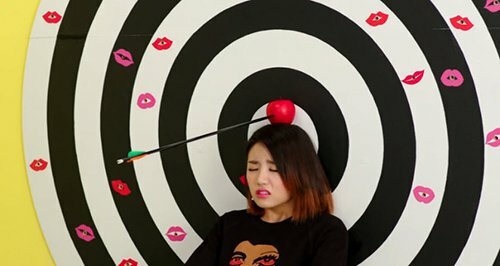 In another scene, EunB is shown sitting in front of a target while arrows are shot at her. EunB does the Illuminati One-Eye sign while arrows are shot at her. Inspired by the tale of Guillaume Tell, EunB must stand still as an arrow is shot above her head. EunB clearly does not appreciate the exercise, as if she was forced into it. In the video, death is also represented using poison. 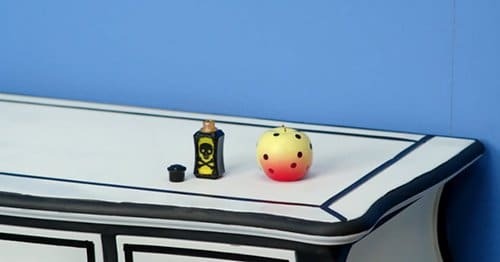 In this scene, we see a vial of poison turning a red apple yellow with black dots. This pattern will represent death throughout the rest of the video. A poisonous frog, which is yellow with black dots, floats towards Zuny using black balloons (representing death). RiSe (the other member who died from the car crash) actually kisses the poisonous frog. In this unsettling scene, a black tree branch (representing death) enters through a window to “offer” an apple. The video ends with a strange scene, and considering what happened to the RiSe, it becomes even more troubling. RiSe is indeed shown moving towards a wall on which there’s a black face. The black face is surrounded by six arms pointing towards it. If one connects the arms with lines, the symbol looks like the Seal of Solomon, giving the “death kiss” an occult, ritualistic aspect. 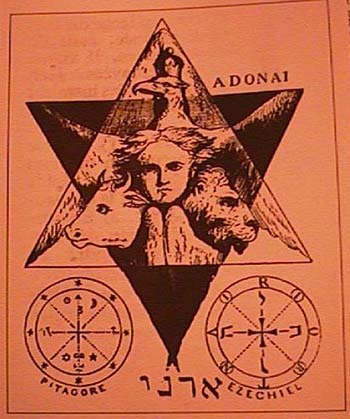 The Seal of Solomon as depicted by occultist Eliphas Levi. In this scene, RiSe is sitting on a chair while she is “rolled” towards the wall. Strange fact: RiSe died after the van crashed into a wall. The machine, however, stops because Zuny pulls the plug. Strange fact: RiSe died in the hospital several days after the crash and after several hours of brain surgery. Was the plug pulled on her? 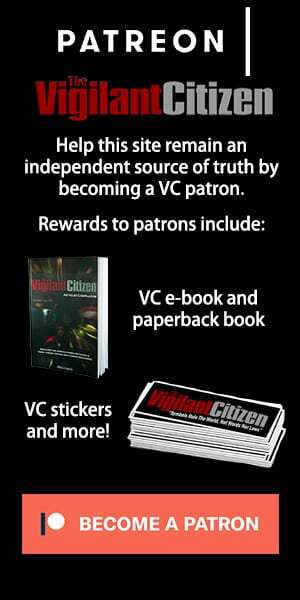 The girl group Ladies’ Code was featured on Vigilant Citizen in 2013 because their video Hate You was replete with symbolism alluding to Illuminati mind control. 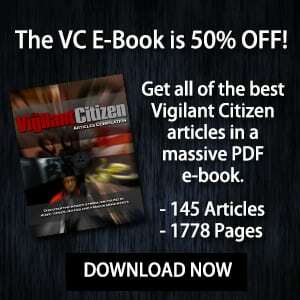 A year later, two members of the group lose their lives in strange circumstances. Whether it is a classic case of synchronicity or a classic case of Illuminati “foreshadowing through symbolism”, Ladies’ Code’s last video was all about its members being “kissed by death” and symbolically flirting with their own demise. 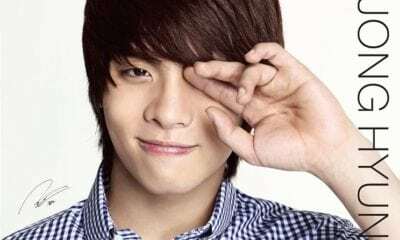 While several strange, symbolism-laden, celebrity deaths were covered on this site, it is the first time that such an occurrence happens in South Korea. One might, however, say that this kind of sick event was bound to happen as K-POP has been replete with Illuminati symbolism for years. Illuminati control over an industry is not simply about surface style and symbols, there is a deeper, darker aspect involved with this. The death of EunB and RiSe might be proof of this.